Little Common Football Club has fallen into the relegation zone with four matches of the season remaining. 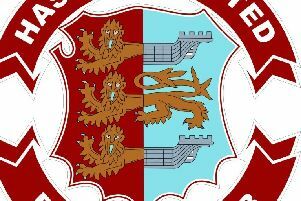 The Commoners dropped to second-from-bottom of the Southern Combination League Premier Division after Eastbourne United AFC went above them last night (Tuesday). United won 2-1 at home to Peacehaven & Telscombe in their game in hand after scoring a precious late winning goal. Common are now a point below United - who occupy the final safe spot of third-from-bottom - and fourth-from-bottom Arundel, but have a better goal difference than both. The Commoners have lost their last five matches, but on paper they have a more favourable run-in than their rivals, with none of the top seven to play. Southern Combination League Premier Division bottom six (played-points): 15 Langney Wanderers 34-34 (-27 goal difference), 16 Loxwood 34-30 (-27), 17 Arundel 34-24 (-45), 18 Eastbourne United AFC 34-24 (-46), 19 LITTLE COMMON 34-23 (-38), 20 Shoreham 34-21 (-50). Remaining fixtures - Little Common: April 6 Pagham (h), April 20 AFC Uckfield Town (h), April 22 Langney Wanderers (a), April 27 Crawley Down Gatwick (h). Arundel: April 6 Newhaven (h), April 20 Chichester City (h), April 23 East Preston (a), April 27 Broadbridge Heath (h). Eastbourne United: April 6 Broadbridge Heath (a), April 20 Newhaven (a), April 22 Eastbourne Town (h), April 27 Pagham (a). Shoreham: April 6 AFC Uckfield Town (a), April 20 Hassocks (a), April 22 Saltdean United (h), April 27 Newhaven (a).